I wrote a science fiction YA for the anthology Brave New Girls: Tales of Girls and Gadgets. It was a charity anthology spearheaded by my friend Tina Closser and Mary Fan and all proceeds for the novel go to the Women in Engineering Scholarship fund. It was a cause that spoke to me and I knew I just had to write something for it, even though it was way way out of my wheelhouse. I wrote about a teenager named Meg who inherits a wonky time machine from her neighbor who dies of cancer. I loved it. I can’t say I nailed the sci-fi parts, or even the YA parts, but I think I did okay and I LOVED writing it. I even got an illustration out of it by a talented cartoonist Hazel Butler. Stop talking about writing and write things. Don’t worry about sitting down every day, but do worry about sitting down and writing things sometimes. Don’t listen to most of the advice out there, because much of it is people just telling you things that didn’t work for them. Listen to hugely successful people, like Stephen King. Buy On Writing. Some of this business is luck. Some of it is hard work. A little bit of it is talent. But don’t forget that it is a business. Yes, writing is an art, but if you want to write books that other people want to read, study the business and study the craft. Doing one without the other turns this into a hobby. Try to get better at one little thing every time you sit down, whether it be business or craft. You don’t have to eat the whole pie at once. Hands down, meeting other writers. Writers, above all else, are readers. Voracious, analytic, enthusiastic readers. Look, I skipped my own signing at ThrillerFest to meet Gillian Flynn. I just spent half a week in New Orleans with some of the greatest mystery writers alive at Bouchercon. I met Michael Connelly and Harlan Coben and Karin Slaughter and Lisa Unger and Lee Childs and David Morell and I came home absolutely HIGH. I get to say I AM YOUR COLLEAGUE. WE ARE PEERS. And this makes me positively giddy with excitement. Everyone thinks this! I don’t know why. My characters are never based on anyone. Except THOUGHT I KNEW YOU, where the main character was clearly modeled after myself, because it was my first novel and I didn’t really know how to develop a character. Some reviews call her boring and I try to pretend this doesn’t bother me AT ALL. But people will call me: who was this crazy aunt? Who was this neighbor? The true, real answer is, it’s literally no one I know. It’s just an amalgam of traits I’ve observed in my thirty-eight years of interacting with mildly interesting people. Believe me, most people I know personally aren’t colorful enough to warrant an entire book character. We’re all suburbia parents, barely getting enough sleep and trying to string together a day. With THOUGHT I KNEW YOU, everyone wanted to know: which guy was my husband? The truth was a blend, all the great characteristics of Drew and the bad characteristics of Greg, but magnified to make it actually interesting. It always makes me laugh and people always ask. I do. Her name is Elizabeth Buhmann, and she wrote a fantastic mystery called LAY DEATH AT HER DOOR. She’s my best first reader, and I reserve her for when I’m ready to turn the manuscript in, because she’s sharp, she’s critical, she’s complimentary, she’s a fabulous reader and writer and I respect her so much. I just finished writing a short story called Lilith Wade, about a serial killer on the loose in a small town in Pennsylvania. In a month or so, I’ll start a new novel, called The Remainders, about the daughter of a serial killer who is accused of murder. The stories are related, and I can’t wait to figure out Edie’s life and past, her relationship with her mother, and whether she finds the real killer. Or maybe she is the real killer? This is the most fun part of starting a new book, the before you start part. Thanks so much for stopping by, Kate, and all the best with your new book! 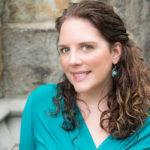 Kate Moretti is the New York Times Bestselling author of THOUGHT I KNEW YOU, WHILE YOU WERE GONE, and BINDS THAT TIE. She lives in Pennsylvania with her husband and two kids. 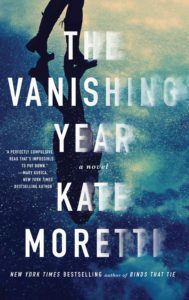 Kate’s worked in the pharmaceutical industry for ten years as a scientist, and has been an avid fiction reader her entire life. She enjoys traveling and cooking, although with two kids, a day job, and writing, she doesn’t get to do those things as much as she’d like. Her lifelong dream is to buy an old house with a secret passageway. 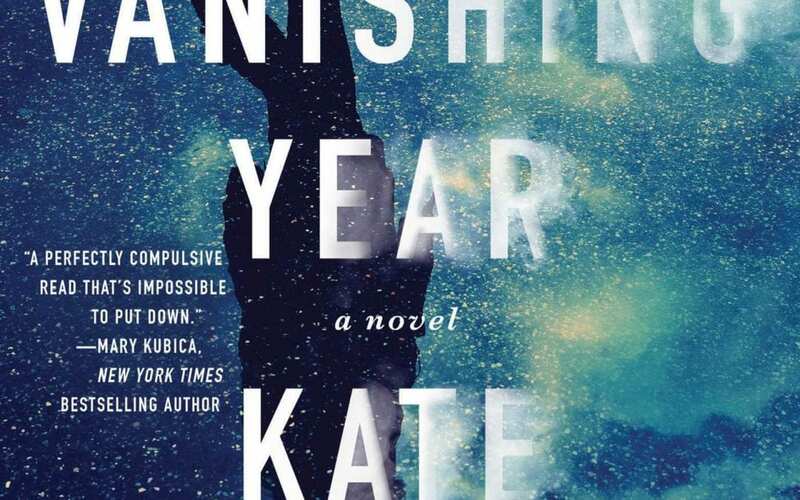 Kate’s latest book, THE VANISHING YEAR, is out 9/27/2016. Find Kate on her Website, Facebook page, Instagram and Twitter.